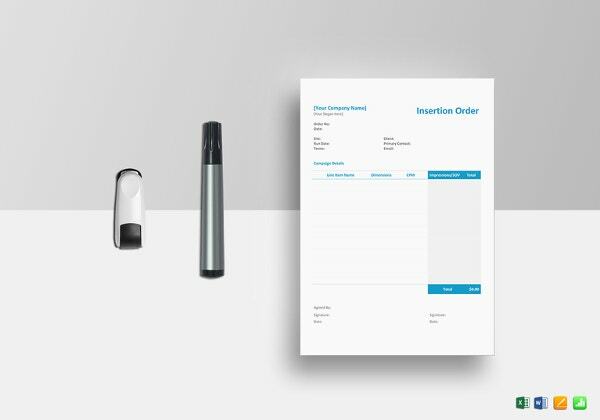 As you receive bulk of orders from your customers, you need a tool that will keep you updated and to remember these orders from time to time. 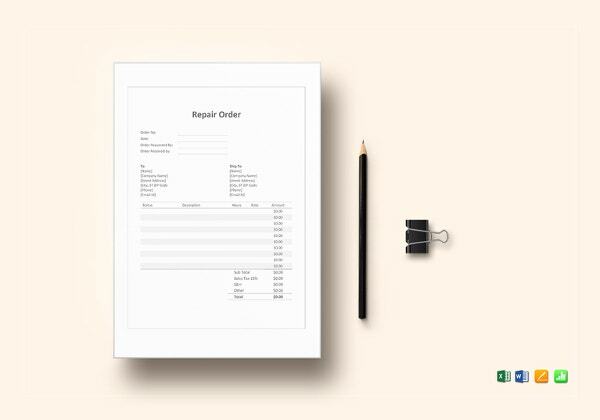 A repair order template will let you know the right format for order that will be given also to your customer after purchasing a repair service. 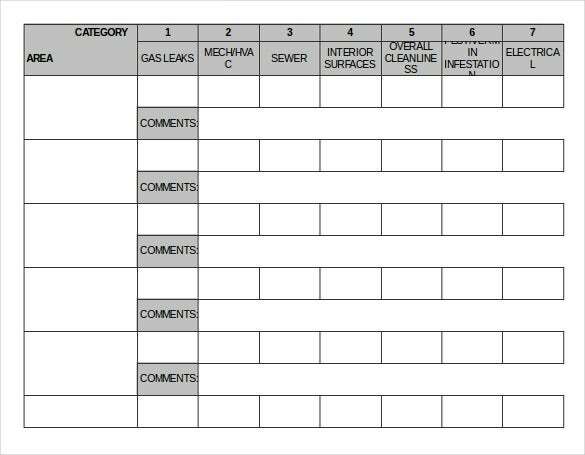 This is similar to a Construction Order Template. 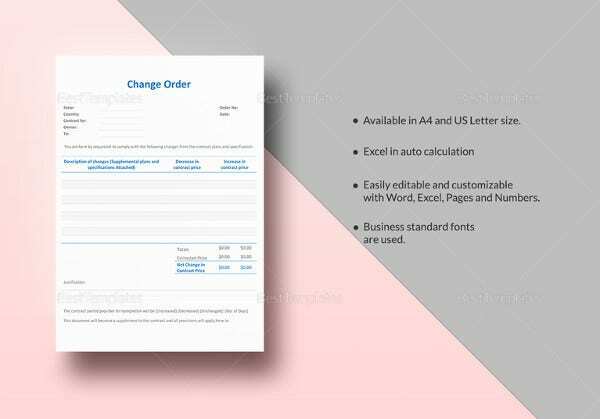 There are samples in Word, Excel or PDF format found in template online. 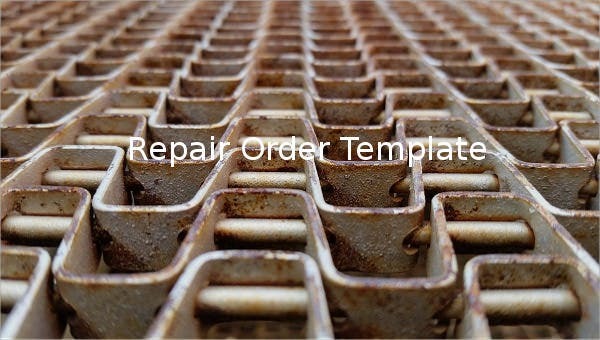 apcs.net.au | This is a Simple Repair Order Template which has two parts. Upper one is horizontal detailed information such as RMA no. , Date, Company name, E-mail etc. And the lower part has details about the defect and Serial no. 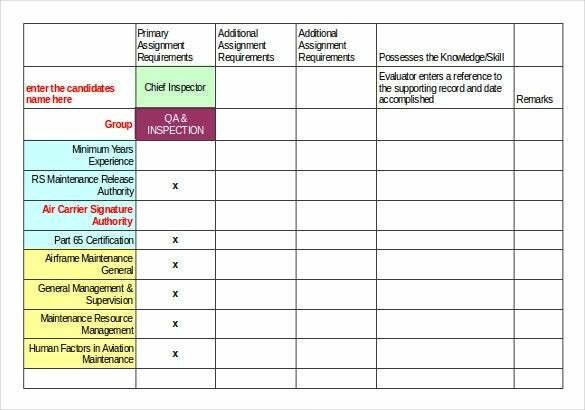 documents.dgs.ca.gov | It is a Repair Order Excel Template which is a tabular format for the information about Good Repair Order. You can mention all the goods which need to be repaired along with providing comments. 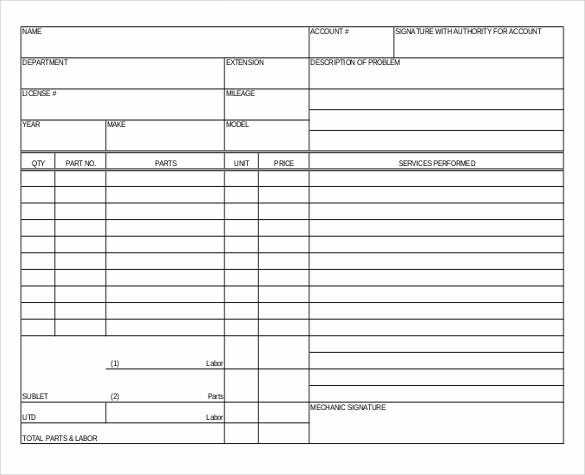 wsdot.wa.gov | This is an example template For Repair Order Template and it keeps close details of Repair Order. It keeps the description in Operation Controls attribute. Also it has other fields such as Surveillance system, Exterior, Tires and wheels, Batteries and undercarriage. utdallas.edu | It is a PDF Template form which is made for Garage Repair Orders. It keeps track of all such Garage parts, Quantity, price, part no. and services performed. It has other fields such as Name, Department, License and Mechanic Signature. fanniemae.com | This Format is for the request of property preservation. It has two sections. Section 1 is Loan and Contact information and Section 2 is Fee Request Information. Section 2 has two parts i.e., Securing and Lawn Maintenance. 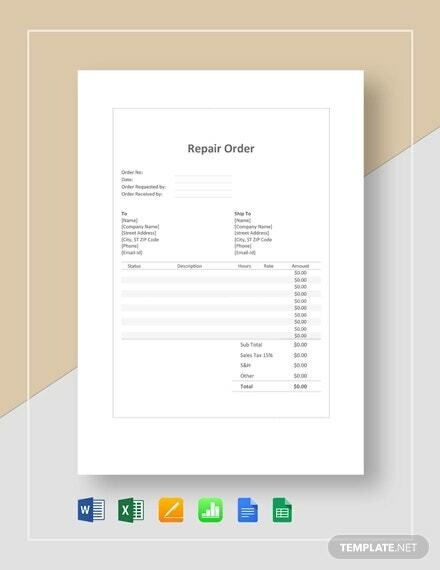 invoicingtemplate.com | This is an easy and a spacious PDF Template for Auto repair Invoice. It has full details and description along with quantity, Unit price, Model, Color and Line Total. At last it gives you the subtotal and a total amount that customer owes. 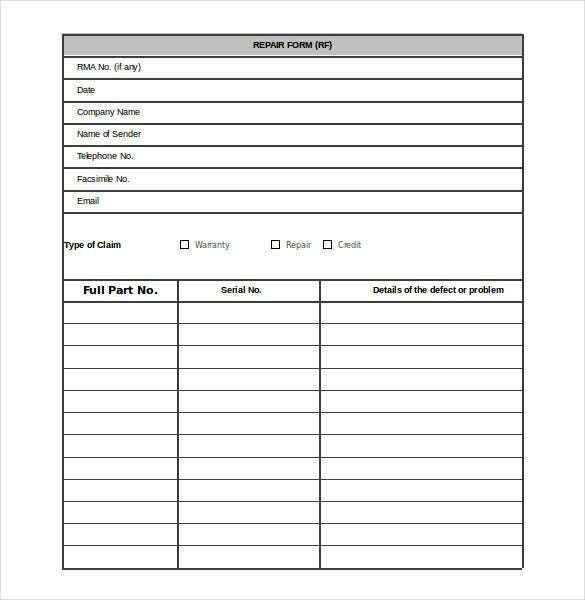 economicdevelopment.act.gov.au | This is a general Work Order Form so that a confirmation of work is maintained. 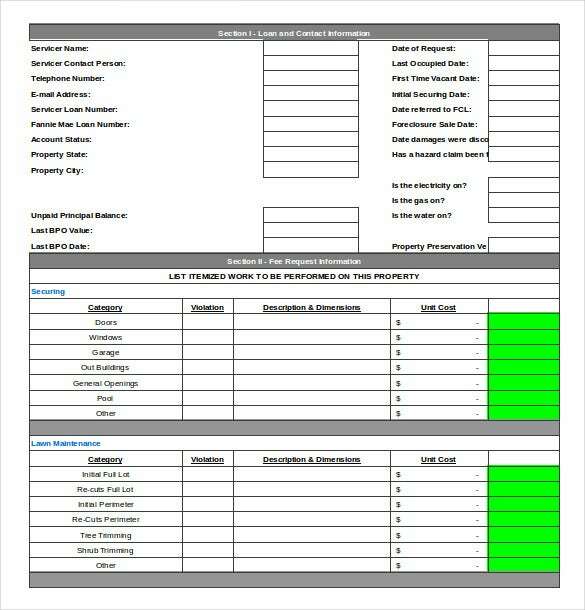 It has different fields such as date logged Building, Client, Bill to, Onsite contact name and the type of work/repair required. 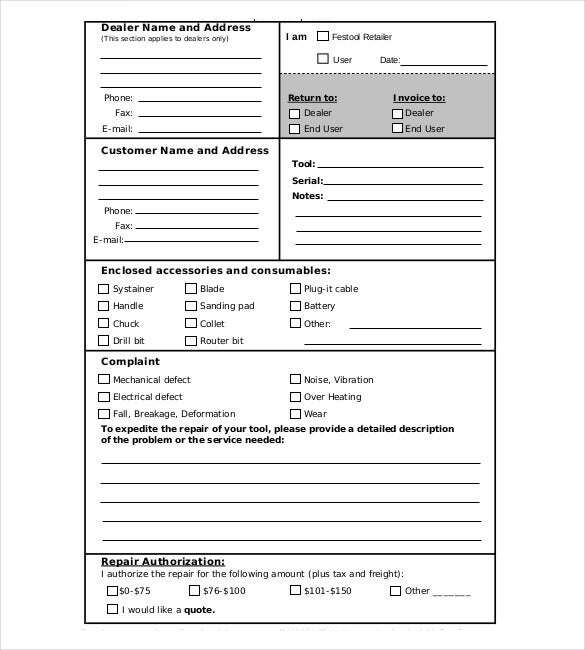 meenamedical.com | This is an Equipment Repair Order form and so it has all description about Type of Equipment Repaired, List of Accessories, and Description of problem. It also has a field of providing signature. Details like Model # and Manufacturer are also mentioned. 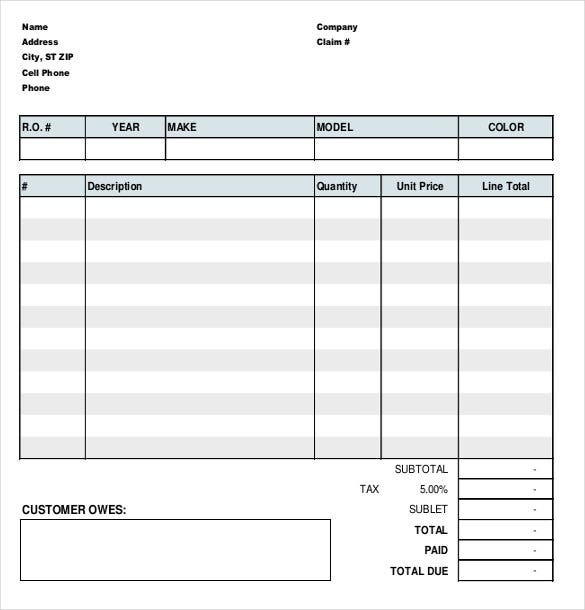 festoolusa.com | This Repair Order PDF template is divided into different number of blocks. First block is all about Dealer Name and address. Second block is about Customer Name and address. 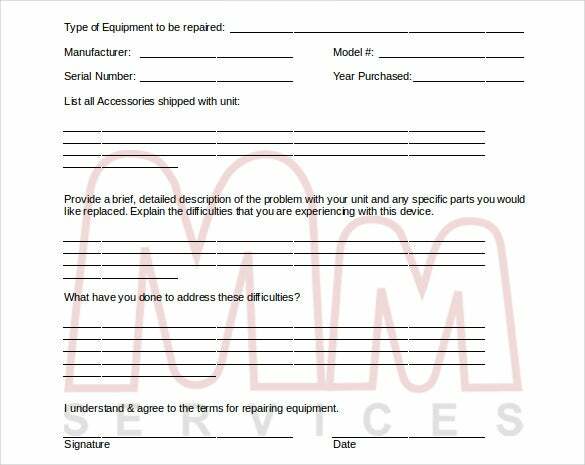 Then we have enclosed accessories and consumables, Complaint and Repair Authorization. 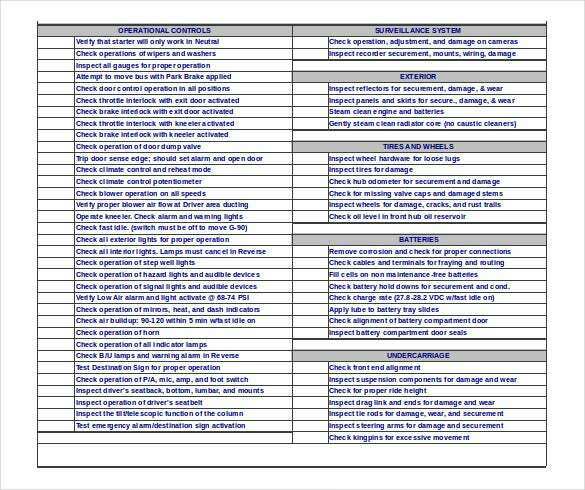 faa.gov | This Repair Order Excel Template is a customizable format. It has total of six columns. 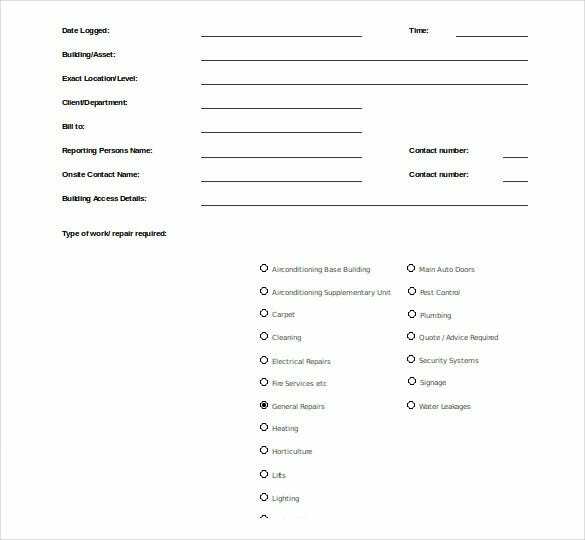 It has fields such as Primary assignment requirements, Additional assignment requirements, Knowledge/skill, Evaluator’s reference and Remarks. So, it is very conveniently designed.